4. Incra MITER1000SE 1000 w/18"-31"
Patented sawtooth racks position your work to within .002"
I purchased this on April 11th. About 30 minutes later I needed to cancel the order. I found a cheaper price locally. They indicated i could not cancel the order but I could refuse shipment, and they would credit my card. That was almost 2 months ago. They have not credited my card and refuse to give me a phone number where I can speak with a CSR. No more Amazon for me..... To bad I liked this place. Sometimes principal can be a pain. Anyone researching this fence has probably already read numerous positive reviews and user comments about this system about Incra in general. Yep, it DOES take up a lot of precious floor-space. This is especially compounded by moving the rails further to the right to extend rip capacity. My fence is not flat. I read a ~.020" bow (proud in the center behind the carriage) with my dial caliper over the length of the fence. I expect I could grind this down, or shim out via a sub-fence. The rails are LONG, and supporting them, while not required, seems prudent. This is especially true if you're dropping a router in an extension wing. The "hairline" cursor on my positioner is not a hairline - it's tough reading that little scale, too - I think I could easily lock down 1/32" off and not realize it (this could be my vision, though). I noticed that clamping the positioner in seems to move the fence a little. Not a big deal but it makes initial set-up a little hit-or-miss. This is a modular product, so the terminology gets confusing. You're looking at a TSIII fence "system" - it includes the Ultra positioner, rails, a mounting plate, fence, and carriage. To Incra's credit, these items are all offered seperately, but this makes it a little more confusing. Some of these parts are identical to the router-table based systems (the positioner, the carriage, e.g.). It seems a little redundant to buy a TS AND a RT system since they share these components. The knob to clamp down the front of the fence seems a little cheesy, and the back of the fence is clamped down with a (supplied) Allen wrench driver. Just seems odd compared to conventional systems. 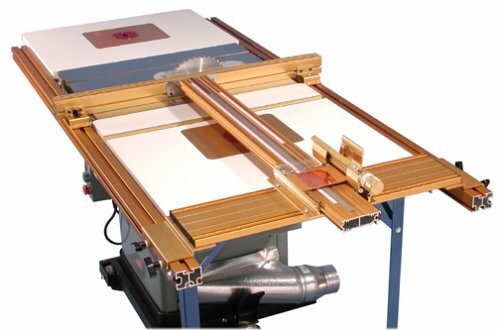 Obviously these are picky little issues - it's a clever design, it's very modular (adding extension tables/ accesories is a breeze), manuals and packaging are the best I've seen, it can serve double-duty as a RT fence, etc. With many more words I could convey: the system is really flexible and will allow you to come up with a configuration that will suit your work needs/style. I'm saying nothing about accuracy here because I think that's been covered well elsewhere. The fence seems to remain square to the slots / blade, but it just feels unlikely that this is true when you use it. The center mount, friction from dragging hold downs, and general "flimsyness" of the system (in it's unlocked state - when locked, it's very secure) make me feel like the fence is skewing all over the place. Three hundred plus dollars for a fence to be mounted to a five hundred dollar JWTS-10-JF table saw - I have to be crazy! It took me a while to justify an investment like that for a cheap contractors saw, but it was worth every penny spent. Assembly of the Incra TS III was easy with the detailed instructions provided. Minor details, such as shims, extra bolts for every occasion, and individual hardware packaging allowed for hassle-free assembly and a touch of class. Not to mention every tool needed (except a wrench) was included for ease of assembly; it took under two hours to "rough" in the fence assembly. I left it over night while I dreamed about the lumber that would be cut the next day. It took me about 30 minutes or so to make the final adjustments, and it is worth it. I made several cuts after truing the fence. Repeatability is well within the .002" tolerances described (I used dial calipers to check measurement), as I went from 1" to 2" cuts then back to 1" with unmatched precision. The micro adjustment feature allows for adjustments as small as .001" - well within anything I will be making in my woodshop. Everything about this fence shouts quality. I am hooked on the system, and would recommend it without reservation to anyone thinking about making a change from their standard fence. I bought this fence after researching various premium table saw fence systems but I was initially hesitant to commit due to the high price (compared to some of the other fences out there). Being unable to find even a single poor review on this product, I finally decided to give it a try and I'm glad I did. Once installed and calibrated the precision of this fence is amazing. The 3 included scales (1 steel, 2 mylar and a slot for a fourth) can be individually adjusted thereby making different fence and blade setup combinations easy while maintaining precision. The fence has built-in sawtooth racks which allow positive stops to 1/32" and a fine adjustment knob allowing you to fine tune the fence position to an astounding .001". Of course under the vast majority of circumstances, this level of precision isn't necessary but it sure is nice to know its possible if you need it. Further, you can move and reposition your fence to the left side of the table and back again quickly and without losing ANY accuracy. The fence installation was straight forward and installed easily on my newer model craftsman contractor's saw. 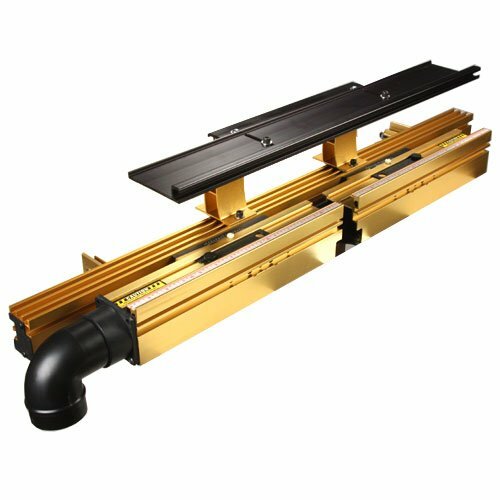 The fit, finish and quality of the various components are outstanding and once assembled the system is very robust (even with the 92" rails which I upgraded to). Overall, I can find no fault with this fence except the high price. However, if your serious about the quality of your tools, this system is worth the price. This is another superduper product from Incra! The versatility of this fixture is amazing. I assembled and squared it to my blade in minutes. I have a left tilt saw so I set it up for both miter slots. Changeover from one side to the other is only seconds after the first time. They provide extra fasteners to act as "stops" for the fence position so you don't have to check blade clearance each time you swap sides (as long as you are using a regular blade, dado sets will require additional adjustment.) They also provide screws to fasten an auxiliary wood fence up to 3/4" thick. I left mine a little long on both sides so I could index the kerf in it. The 24" length of the metal fence allows greater control of longer pieces. The cleat can be micro adjusted to fit the miter slots on your saw - NO PLAY! Setting exact angles is a matter of dropping the index point into a tooth at the desired angle and tightening the knobs. As with all Incra products, you can set a position between whole degrees and there is a jag at 22 1/2 degrees for box builders. The "Shop Stop" provided with it is a gem. It is attached to the fence with Incra's precision indexing system, but is also infinitly adjustable. It has a stop bar that is adjustable with a screw to smaller tolerances than I need. There is also a verticle flat stop that is run down to a mm or so above the table. You can also fasten shop made stop blocks to the fixture for special shapes (i.e. angled ends). The Instructions for both items are simple and clearly illustrated with line drawings. Put one of these on your saw and you'll never want to leave your shop! What a great addition to my shop! I have set up my Craftsman contractor's saw as the center piece of my shop. I perform as many operations there as I can. 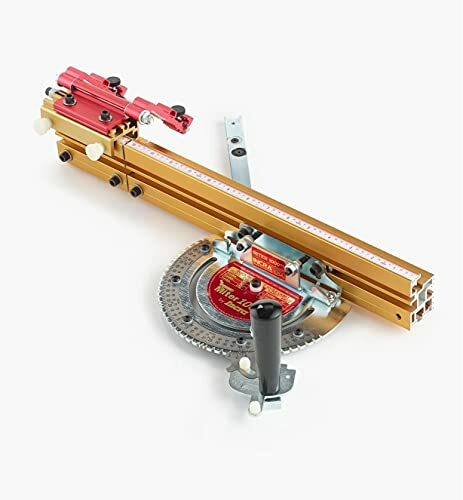 This tool has given me the accuracy I desired in making miters and in cutting stock to length. It took less than 10 minutes to set up (I set mine to work on the right side of the blade) and my first cut was dead square. While the included stop is extremely accurate, it lacks a hairline pointer for easy set up. Once you figure out how to sight down the end of the stop, it's simple enough to use. What really makes this guage great is the fact that you get absolute repeatability. 45 degrees is 45 degrees everytime you set it. No fuss and no doubt. I have owned the Incra Miter Gauge (bought before they started different models) for a couple of years and would have to say it is not worth the cost. I cannot begin to estimate the amount of time I have spent trying to set it to get a consistent 90 deg cross cut. I finally gave up and got a similar product from a different company for less, and although it is not dead accurate - its closer than I ever got with the Incra. Many claim success - but I have to wonder how long it took them to get it that way - and does it keep its setting, mine does not. Good Luck. The short version: set-up took about 3 hrs due to poor directions, sloppy detailing and bad drawings. Operation met expectations. 1. Get about 10 machinist shims in increments of .001 or .002. These will be needed to adjust to square with your table. This beats measuring slips of paper with a micrometer and figuring out how many to slide into place. Mine took .005 to square. Their "Tip" between steps 1 and 2. 2. Do calibration step 1before step 2 in assembly to avoid double handling. Remove the allen screws and rub with some wax or dry lubricant. The screw heads build-up so much friction against the plastic expansion washers that you can almost break your 7/64 allen wrench. 3. When setting up for the right side --IGNORE their drawing and instructions. They show a through slot connecting the fence to the mounting bracket. It is not slotted which means that when you remove the fence; you can't get in back in with loose washers supplied. I ended up making a ball of wax paper to put behind their slotted washer to be able to reinstall the cap screws -- this will make sense when you see the unit. Remember that you will have to do the same table squaring step for the right side as you did on the left. It's incredible that they supply a part that's completely different than their drawing. 4. The Shop Stop is generally well designed part, but the manual provided is useless for initial set-up. The rack system is very accurate and the positioning works well after you set the rule to your machine. In operation, the unit is excellent. Changing from 90 to 45 takes 5 seconds and is totally accurate. Too bad they don't have someone in engineering actually assemble the unit from their drawings and instructions before sending out to customers. The INCRA 2000 has two faults. 1) The Angle bracket that holds the fence is just a bent piece of steel. Mine was far from square and had a slight twist. Tired of the recommended shimming to correct, I made my own from angled stock. 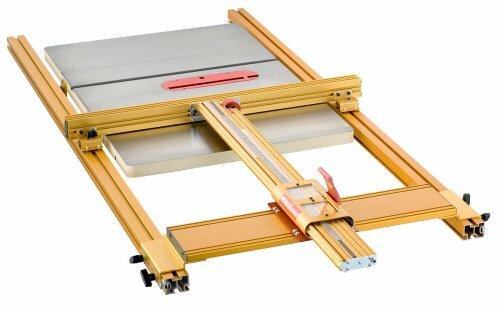 I just bought one of these for my old Delta-Rockwell table saw. The accuracy for mitered cuts is incredible. At this point, I can only find two faults with it. First, the guage blade is an anodized aluminum extrusion, with channels in it to hold the adjustable stop. The front surface of this blade is so slick that I have a hard time holding the stock stable while feeding it into the saw. This front surface needs to be tactile to keep the stock from slipping. I plan on adding a layer of self-sticking stair tread safety grip. The second fault is the two screws which hold the guage blade to the protractor. After setting the miter blade position for 90 degree cuts, the blade position is secured by two allen head screws (wrench is provided). But, to make 45 deg. or other angled cuts, the blade needs to be re-positioned with respect to the saw blade and that requires loosening the screws with the allen wrench - sort of awkward. If these screws were thumb-screw type or maybe some sort of cam lever, changing the miter blade position wouldn't be so tedious. Special stops at plus or minus 22 1/2 deg. I have been facinated by the Incra Jig demos at woodworking shows for years. I was lucky enough to recieve a 24" ultra, the master template library, and the three videos as a birthday present. The set-up was fairly simple if you take your time. I had one snag during set-up, I was missing one small bolt, I scrounged around and found the correct size at a local hardware store. I was up and running, cutting near perfect box joints and dovetails in just a few hours. I also was missing a template that was refered to in one of the videos. A quick e-mail to the incra (taylor design) customer support department had both the bolt and the template in the mail and delivered within a week, no questions asked. Overall, this is an excellent product that does everything it promises, as long as you follow the instructions. The company was very responsve to correcting their errors and will get my business again. First of all this as an exceptional tool. I am a joinery novice but am now creating professional dovetail joints without problems. I have two comments that I think would be important to new users. 1. The setup directions are very confusing. 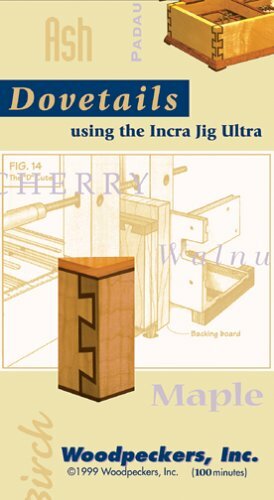 Incra includes directions for every jig variation and accessory variation all within the product manual. I actually had 4 (yes four!) different documents that I was being refered between and still couldn't find the exact document for my fence - until a change page fell out of one of the docs. I think that officially makes 5 separate docs. I guess Incra changes their products often and doesn't recreate assembly manuals. 2. Setup is everything. If you get the router bit depth and find the board center accurately, you're home free. I've started using a dial indicator and caliper. It may seem like an overkill but the extra time upfront allows me to create near perfect joints all day long. A nice dovetail jig for small projects. Without going over all of the other comments I would have to say this this is a nice tool. It does what it says it will. You can put together very nice looking basic dovetails as well as doing some fancy ones. The problem with this thing is that it gets mind numbing messing with that micrometer everytime you move the jig to make a cut. If you do not do it right each time error will start to show in your joints. That said, for a small box with only a few dovetail joints it is not a big deal, but if you are going to do LOTS of big things with many dovetail cuts you might find this gets old very quick. The big plus of this jig is its versatility. It comes with many sizes and patterns of dovetails that you can do in short order. Others have made note of the sharp edges on this jig and I would have to go along with them. It is not a big deal, but a point well taken and something that the Incra people should have taken care of. For the most part I think this is a very nice jig for the person that does small projects in small numbers. If you are going to make large number of big items I would go for the Leigh jig for not too much more money. I've been working with wood 36 years now and can say that using the Incra Ultra24SYS is a pleasure. I have owned two other dovetail jigs, and this jig is by far superior either one of them. As with all dovetail jigs, set up is critical and can be somewhat time consuming. Once this jig is set up, repeatability is superb. I have read other reviews and agree with them for the most part. As for children being injured by the sharp edges on the ends of the aluminum extrusions, children should not be around this type of equipment. I do agree that plastic caps would look better and could solve this problem. This machine is a dream machine. The tool does perform flawlessly as promised initially. However, this depends on how long and how often you use for various mitering angles - the pivot hole of the stamped plate will wear out quickly against the pivot pin. When you get large play and the miter gauge will be no longer accurate. I think this is a design flaw for being made cheap. Angle precision is great. But length system kind of sad. I look at this fence and I am kind of baffled at why such a poor system of setting the tapes was chosen (there is an independent slippery segment every 16 inches). The tapes are Mylar or something similar with a little translucent window you're supposed to use to align a succeeding segment with a previous one. Wow, you can futz with it for 20 minutes. Then it moves but you don't know it. INCRA says you can tape the segments together, once aligned. The problem is, it buckles the tape and still moves and you don't see that either till you have ruined a cut. Is this feeble setup really from INCRA? Why not one 32 inch segment?? It really is comical. Periodically, through the day, you must re-check zero. Then, if you have to adjust (and you will), you also must adjust every segment. WHAT? What's next? Well, how about that for the slide out (telescoping) arm they INVERT a left hand tape!!! For goodness sake, why not use a right hand tape so you don't have to read it upside down?? For angle precision I give it 5 stars. For setting up cuts to length, I give it ZERO. Since I can't score the average of 2.5, I'll just give INCRA a half point and rate the whole thing a 3. No, I forgot the amateurish micro-adjustment on the flip stop. I'm coming down to 2 stars from 2.5 instead of rounding up. The funny thing about these two issues is both are highly visible, one or the other affects EVERY cut and would be EASY to rectify. WHY does a manufacturer run so strong and then peter out when it counts on things so cheap and easy to avoid? 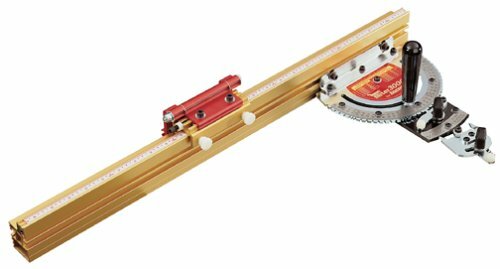 The protractor head, associated knobs, fittings, and adjustable miter slot bar are very good and probably provide a high degree of accuracy. The problem lies in the attachment of the fence to the protractor head thus negating the protractor head accuracy. There is a piece of 1/8" angle iron between the protractor head and the fence (3/4" x 1-1/4" x 6"). The narrow leg is attached to the top of the protractor head with three screws and the other leg is attached to the back of the fence with two screws. The three screw connection to the protractor head provides adjustment to set the protractor head square to the ts blade. The two screws holding the angle iron and fence together are backed with threaded plates that slide in the fence thus allowing the fence to be moved from side to side. The angle iron between the fence and the protractor head is not sturdy enough to prevent the fence rolling from front to back. Consequently there is no way to insure the fence face is 90 degrees to the ts table. The instructions provided say to put tape between the angle iron leg and the protractor head, either in front of the screws or behind depending which way the fence is out of square. It's obvious Incra saw the problem, but did not come up with a satisfactory adjustment. To compound the problem, the protractor head and associated mechanism is made out of 1/8" steel and plastic. Flex in this construction amplifies itself to the fence. This miter guage could be a superior tool if: 1) the protractor head / fence connection was strengthened, 2) heavier guage material or cast material was used in its construction. All of this is mute if the only use of the miter guage was to cut material flat on the table. Unfortunately, this is not the case for most people. I don't have an superior alternative to this miter guage, but am looking. 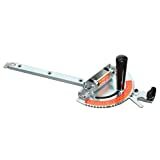 I read all the reviews for the precision miter gauges for table saws. The Incra had consistently good reviews. I was tempted to buy the 1000 as it is only $100, but opted for the more expensive sled (uses the 3000 protractor). The box arrived without a bag of parts that also contained the instruction manual (they sent one out the next day using overnight delivery). It took me about an hour to set up the sled and calibrate the miter gauge. I cut two practice pieces and then proceeded to cross cut both ends of an 18 x 26 inch wide maple panel. The cuts were perfectly square. There was one negative review on the web about the nylon spacers used to snug fit the bar in miter guage slot. This was a concern, but I discussed this with Incra and if you do wear the sides slightly on the nylon spacers, you need only loosed then and then rotate them slightly to regain the fit (or call them and they'll send you new ones). Also, if you buy the 3000, you can buy the upgrade for the sled, but you will want the sled (if you haven't already made one yourself). This is a great precision tool. I've needed a precise miter guage for some time now. 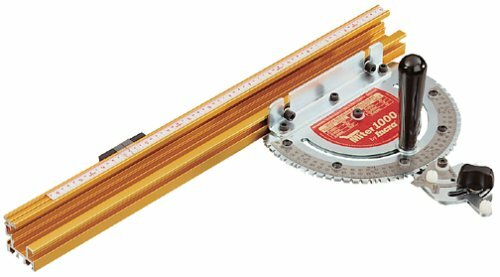 On the recommendation of a woodworking buddy who had bought a Incra 2000 miter guage and liked it, I purchased the Incra 3000. I cannot believe I existed for as long as I did without this wood working tool. The miter guage and fence is accurate, easy to use, and precise. It allows one to make segmented wood rings quite easily. 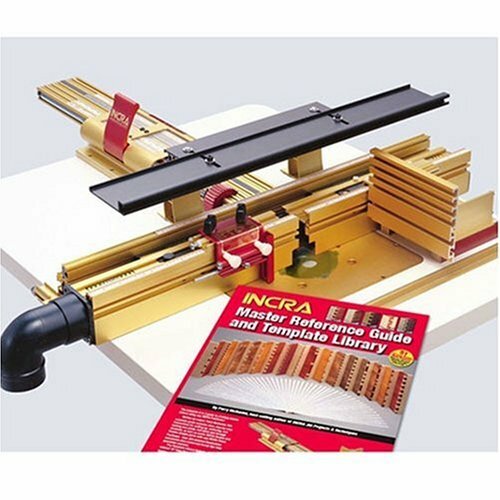 The Incra 3000 uses mechanical stops for all of the commonly used miters. Using a unique fine adjustment half degree increments can be obtained. This feature, while very handy can get you in trouble if you forget to retun it to "zero" before changing to you next angle. No fault of the tool, just the user's forgetfullness. The 3000 is an upgrade from the 2000 in that the miter guage swings in both directions while the 2000 need to be taken aprt and reassembled if miters in the other direction are required. Tool setup and alignment are easy and the directions are great. I would highly recommend this product to any woodworker who needs accurate miters. I'm hooked on Incra "Mania"
I first bought the Incra TSIII-32 table saw fence. I became indoctrinated into the Incra system. One that creates unbelievably accurate results with the least amount of effort. When I tell others that my fence-table saw is adjusted so that I can cut any size board, take out a dial caliper and it is accurate to .002", then get mad at me and tell me I'm either wrong or not telling them the truth, but it is true. I then bought the 6" rule, and it is so accurate, I measure all of my other measuring devices by it. I wound up throwing out my far less than accurate tape measures and rules. Oh a lot of them are accurate through out the rule, but the beginning reference could be off somewhat. What else matters? Some people are not into getting totally accurate measurements. My philosophy is to strive for perfection, and settle for excellence. So onto the rule. Since it has these tiny holes that you place the tip of a mechanical pencil into, then slide the rule along your workpiece. Thereby insuring a perfect line, exactly the distance from the edge. No holding the pencil along a rule, and sliding it along, making a varied line. If you use these rules, and gently begin your cut a hair over the line, you can tweak the workpiece up to the edge of your blade at exactly the mark line. I use the 6" so much, that I decided to get the 12" complete set, which includes the edge-corner rule etc. I know that when I need to mark a workpiece greater than 6", I am going to be cursing myself for needing to use a ruler and a try to make the mark at the right spot method. The thing about the Incramental system, in all of the their equipment, is that it takes less time to make a perfect cut. Some people feel that this kind of accuracy is not essential, but once you get into perfect fitting cuts, your quickly spoiled. Incra is unique. Check out all of their items. This rule set is a nice addition to your arsenal. Highly recommended. I calibrate measurement tools for a living and it's not very often I'm impressed by tools in this price range. I also almost never give anything 5 stars. These are the exception. No measuring device is "exact" but, after calibration, I found these to be as accurate as rulers costing 5 times as much. Also, the aluminum bar is amazingly repeatable. I found that removing and replacing the bar caused no degredation in accuracy. So don't be affraid to adjust the bar to suit your application. As long as the ruler is seated against the stop it will have a remarkable accuracy. The price is the final star in this package. I would expect to pay twice this price to get even one ruler this accurate and useful. But here they give you three. You can't go wrong with these. I love this tool. It will save you a lot of time and hassle when compared to marking with the standard square or tape measure. With the standard way you have to make sure that your eyes are right over the mark to ensure accurate cuts but this tool takes that variable out of the equation. I will definately buy the 18" set next and I hope to see a long 48" version or if possible a tape measure with the same hole type marking. Hey I can dream can't I.
I have owned this fence / jig for about three weeks now and have used it to make several boxes and one case. It is simply great. Everything written about it is true - it is very stable and repeatable. I did purchase the new metal installation bracket that holds the system off of the back end of the router table (in order to free up additional room on the table and not give it up to the tool - download the owner's manual and look at the installation versus your router table to see what I'm talking about). In addition to reading through the manual, I also suggest that you purchase the intro video, which more simply walks you through the setup and usage of the tool. In short, well done Incra! I purchased this fence/jig because I just had to figure out how those outstanding double dovetails and box joints were made. I rec'd the jig within a week of my order. I have used the jig extensively on one of my router tables and it excells at every task I have put it through. Initially, I installed the jig onto a router table with a shop made table insert, but the insert flexed ever so slightly and caused a slight misalignment of the dovetails. I cured this by building a seperate router table with no insert and just mounted the PC 690 base to the underside if the table. Since then, I can easily produce tight fitting dovetails in a matter of minutes, and highly decorative joints for all manner of small boxes in about 15 minutes, minus glue and clamp/sanding time. I am absolutely satisfied and have helped another fried to discover the uses for this tool, he bought the twin linear a week later. 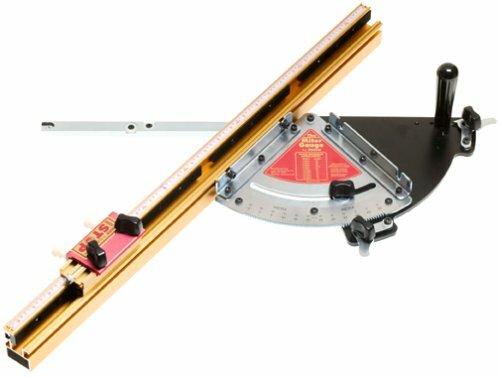 I have also used this at my table saw for ripping extremely thin lamination strips, and it allows you to move the fence after each cut, allowing you to cut from the outside of the workpiece, and to do this with precision to .001 or .002. I have proved this out with dial calipers and a micrometer. 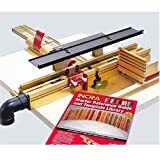 I have not even begun to unlock all the potential of this tool, but if you want accuracy, and +/- 1/32 is not going to cut it, get this jig and amaze yourself and your woodworking friends. I highly recommend the Project Book as a supplement to the included manual Master Library. This is an excellent fence system. Accuracy and repeatabilityare precise and easy. If you have need for a router table, this isthe fence that you should have on it. Having never cut dovetails in the past, I found it easy to cut box joints and double-dovetail joints. However, the manual must be read thoroughly before you start. Trying to follow it step-by-step will cause you to find out that you will have to backtrack to a previous section. Hint: Drop the extra coinage and get the Freud router bit set for the Incra system. Fortunately, I didn't have a lot of router bits yet so this was worthwhile to do. This fence, along with the templates provided, at first seems to be aimed solely at delivering fancy dovetail operations. The tool provides the best accuracy I've seen for this task. If you know and understand dovetails, the specific methods of use for the fence and templates will be clear and you will appreciate its ability to repeat accurate dovetails as well as streamline your operation. On the other hand, if you have never cut a dovetail by hand - or do not understand the geometry needed to make good dovetails, this is not the way to learn. If you just have to have this tool "to grow into" be sure to work a few joints by hand or by router first until you understand the nature of the task before learning this system. Learning on this system could very well confuse or frustrate a dovetail novice. There are other excellent dovetail jigs and fixtures out there (and some really poor ones as well) but the set of templates provided in this system along with the extreme adjustment capabilities make this unit the most flexible by far. If you are into 'trick' dovetails this is the tool. To me the best thing about this fence is what it can do aside from dovetails. It can pop onto your table saw, drill press, shaper or sander and turn it into a machine-shop quality wood cutting machine (or metal I suppose, although I don't do metal so I can't truly say). Precise movements of the micrometer style adjustment of this fence can get you an accuracy that is not easy to get any other way. Precise ripping, drilling or sanding - in the order of about two thousandths of an inch are easily obtained (the tool adjust to 1 thousandth. But in my humble opinion the flexibility of wood and cutting heads make the practical everyday accuracy about 2 thousandths). In my endeavors I have used it to make a precise repair parts for an intricate inlaid floor repair, replacing a cooling tower watertight wooden connector and to make an airtight joint on a vacuum table without using sealers or glues. Just wood to glass - but very accurate wood. 36" heavy duty Rip Fence stays PERFECTLY parallel at ALL settings. This is the finest measuring/marking tool I presently own. Well worth the $17.99 price tag. I will be buying the 12" version and the Incra protractor a.s.a.p. I bought this T-Rule along with Incra's marking rule and their "bend rule." All are terrific and useful measuring devices, and I use them on practically every woodworking project I do. They are accurate down to 1/64", and there are convenient marking holes at each spot. You can use these holes to make a perfect mark at the right measurement. Of course, it's up to you to draw a perfect line across that mark and cut it on your saw, but the Incra rule helps you put down a perfect mark to work from. In some of Incra's brochures, they show a way to use the T-rule to mark your lines. You put the pencil into one of the marking holes, and then you slide the rule along the wood's edge. As the rule slides, a perfect line is drawn. I don't do this myself, but I see that it's possible. Although the rules are made of thin metal, they are very strong. I've dropped my rules a few times, even stepped on the T-rule once, and it didn't seem bothered by it at all. One thing to be aware of is that the measurements on this rule are in 1/32" and 1/64" increments. This means you have to convert into 1/4" or 1/8", which isn't too much of a problem, but it is something to be aware of. It's a fine trade-off for such accuracy. Over all, this is a great product that can be used in every furniture-making project for accurate markings. From Close to Perfect, In Just One Tool ! Commonly we use a tape measure to mark our work piece before cutting. The small tab at the end of our tape measure is always loose. Some argue that it was built intentionally that way, so that when you stretch it, it slides to make up for the allowance of the thickness of the tab. When compressed, it slightly shortens the length to once again make up for the tab. That sounds good, until you actually measure something with it both ways, and come up with a 32nd of an inch or more difference. If we are rough framing that is fine. When we are doing anything that doesn't demand close tolerances, it suffices. What is interesting, is that the smaller the cut, or the finer the project, critical tolerances become all the more important. Installing a set of kitchen cabinets, and you have to nick a 1" corner in something. That can be difficult to do perfectly. If cut wrong, it stands out like a sore thumb. What this Precision Marking Rule will do is give you perfect lines effortlessly. Less time spent, and undeniably exact markings. Incra designed this so that each measurement, whether you are measuring to a 32nd or a 64th can be done almost without your glasses on. Each measurement is marked with a small hole next to it. In there fits the tip of a .5mm mechanical pencil, or sharpen a regular pencil to a fine tip, give it a couple of twists to center it in the hole and you are ready to go. What I did in the past was use a framing square, park my pencil on my measurement, then try to hold it still on the square, while I glided it along. It normally wouldn't hold totally true. With this rule, it prevents the pencil-marker from floating. It stays in the hole for a flawless measurement along the entire line. It is not harder, it is easier. You can see how ultra fine this capacity is. As a matter of fact the incra system is the most exacting measuring, fencing, and marking systems available. Some things we don't need this level of accuracy. On the other hand, once you get into the "incra"mental system, their is no going back. It takes less time, for better results. I just bought the Incra TSIII-32 table saw fence system, and I am sold on the timesavings, and ease of use in doing it right, instead of getting it close. It is nice to know that if I am dealing with tight tolerances, this is standing by to give me the flawless measuring I need. Even if I am scribing a line along a board, that I need to run through the jointer, I know it will be exact. If I had to be critical on the piece, I would say that since it is for fine measuring, the T-slot aluminum track is substantial, but the metal on the measuring face is thin enough that you wouldn't want to step on it. A thick framers square could be dropped off of a second story, but it won't give you this kind of exactness. For the money, you can't beat this rule. Highly recommended, buy it you won't be sorry. Do you cut a lot of tenons and mortises? Here is my summary for this tool. "Wow". That's it. Do you cut a tenon now and again? Buy this. Do you cut a LOT of tenons like me? You HAVE to get this T-rule. With a 0.5 mm mechanical pencil and this tool- well it takes me less than 30 seconds to lay out a tenon- and the mortises are even easier. And the marks are perfect. It took about 4 tries to get the sliding down a board while marking- but now it seems like the easiest, fast, and most natural way to mark anything. I'm not a production shop- this is my "spare" time hobby. And the amount of time saved and accuracy I've gotten from this meager investment... I would honestly say having used it now for a few months I would pay 4 times the price. Okay, that does sound corny. But I'm serious. I have the Powermatic 719A Mortiser, a cabinet saw, Forrest Woodworker II, and this T-rule... and I swear the hardest thing I do now is sanding before the finish goes on. Buy the 06. The 12 and 18 are just too big to use on most furniture parts. 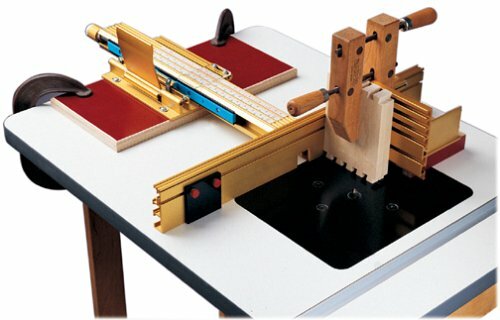 I've owned one of these for about a year and a half and have cut some beautiful dovetails using this system. Set-up is easy and explained well by the manual. Incramental adjustments are easy, and the positioner is rock-solid. You have to be very careful, because your stock may want to move in the middle of a cut when clamped to the right-angle feature. Making dovetails: The templates are easy to follow, but require too many steps to set up. Adjustment and centering of your workpiece is critical, and cutting dovetails by incramental changes in fence position takes just too long if you have more than a couple to cut. I would rather spend the time to hand-cut the dovetails. After my initial few, I haven't used the dovetail function of this jig. I have owned the Intelifence for almost 1 year and it is one heavy duty, rock solid fence. Once set up and clamped down, it will not budge. This is a well thought out fence system with the ability to perform a variety of cuts. I especially like its edge joining ability. To be able to get an edge perfectly straight is priceless. It also helps that the owner's manual is very detailed and well illustrated. If you want precision, time after time, this is the way to go. I have not even begun to use all the capabilities of this fence. It is a really solid design and is not difficult to use once you read the directions. The extruded aluminum parts do not flex at all. I have used it for cutting moldings, rabbets, and with my Jesada 2" x 3/4" diameter Flush Trim bit, as a light duty jointer. The offset is easily adjusted by two screws in the fence face. These are the standards in my shop for accuracy. These rulers remove all doubt when measuring. Very thin laser-etched markings on very thin stainless steel with laser-cut marking slots for using a .5mm pencil. If you want accuracy and a "reference" point for other measuring tools in your shop, this is the one to go with. But... make a rack for them and keep them off the floor... One crimp, and the accuracy is gone. Still... they get 5 stars! If you desire to elevate your measuring and marking skills, this handy set will do you right. If you're frustrated at trying to line up your measuring marks your're not alone. No more squinting at the edge of a ruler to see if you've got it right. Get it right each time with this set. 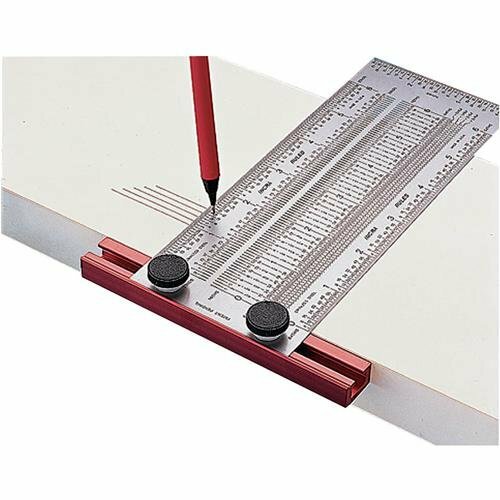 These precision marking rulers have precisely drilled guide slots to fit a marking tool such as a sharp pencil or scribe eliminating the uncertainty in your measurement. The included T-square allows one to scribe the measurement by moving the T-square along a straight edge. Perfect. The marking ruler is handy for making that perfect mark. The bend ruler is great for all those edge and end mesurements. The rulers are made out of very thin stainless steel and if your not careful you can put a hard to straighten crimp in them. Flimsy, won't hold up to feed pressure. I returned this fence. Using the words "Heavy Duty" in the description by Incra?... must be a joke. I would give it zero stars and a Mr. Yuck if that were an option. I am a box maker, using fairly small stock, even so, I found this fence to be very inadequate in it's ability to stay in place ("flat, square, and on 1 plane) when feeding stock against the cutter. This is a serious issue, considering Incra touts the extreme accuracy and incremental measuring capability of this fence to the finest degree. (All of which becomes totally useless if the thing won't stay flat or square under pressure.) You can put a 64th incremental measuring tape sticker on anything...doesn't mean it'll be accurate. Ps: I purchased this and returned it the same week in 2002. Perhaps it has been improved since then. Looks the same to me though. I returned this fence. I would give it zero stars and a Mr. Yuck if that were an option. I am a box maker, using fairly small stock, even so, I found this fence to be very inadequate in it's ability to stay in place when feeding stock against the cutter. This is a serious issue, considering Incra touts the extreme accuracy and incremental measuring capability of this fence to the finest degree. (All of which becomes totally useless if the thing won't stay flat or square under pressure.) You can put a 64th incremental measuring tape sticker on anything...doesn't mean it'll be accurate.